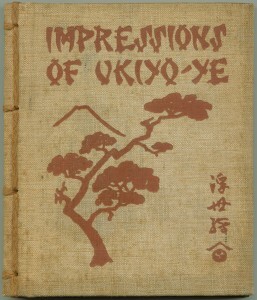 Cover of “Impressions of Ukiyo-ye”. At lower right are three kanji that read “ukiyo-ye”; followed by a tomoye with a ‘roof’, which has no meaning. 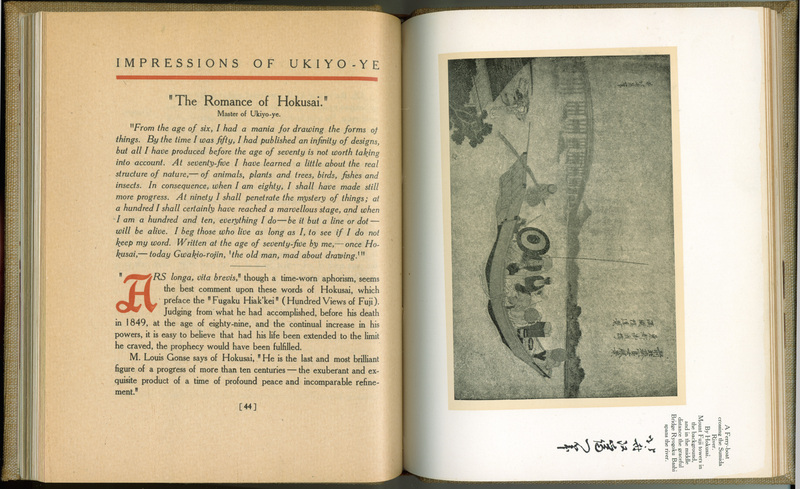 Japonisme was all the rage at the turn of the 20th century, and Paul Elder’s carefully constructed bookstore-as-art-object was, in many ways, built upon the Japonisme sensibility. 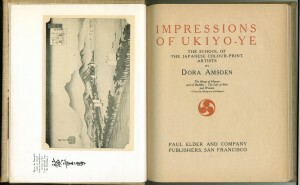 Dora Amsden’s Impressions of Ukiyo-ye, published in 1905, was the first of several Elder publications about the art of Japan block printing. 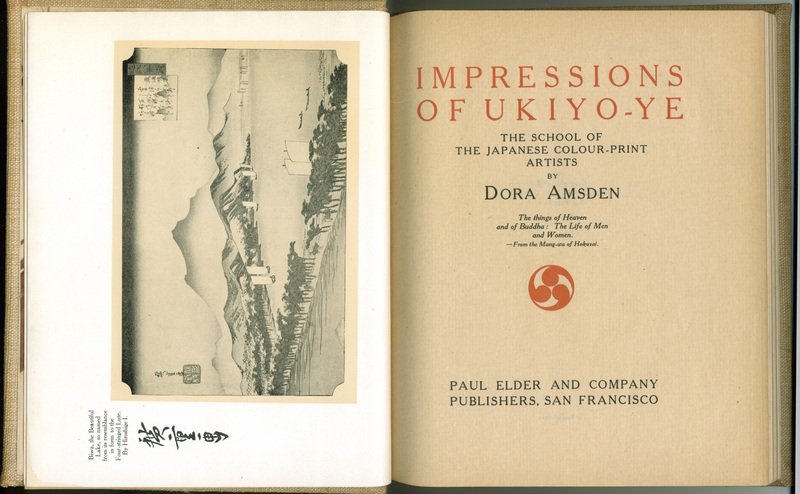 Elder was no doubt happy to use the double entendre “Impressions,” suggesting both hazy romantic views of Japan as well as the physical image of a printer pressing his paper to the stone. Indeed, Elder’s in-house magazine was also called “Impressions,” surely for the same reasons. Ukiyo-e (浮世絵) means “pictures of the floating world” and refers to a style of Japanese woodblock prints and paintings from 17th- to 19th-century Japan. The subject matter is often landscapes, historical scenes, kabuki theatre, birds in the trees, and, of course, attractive women. Impressions of Ukiyo-ye is bound in a Japanese style, with visible external cording on the spine. 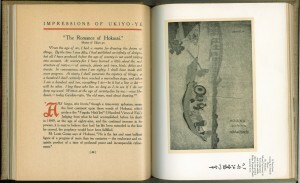 The book uses thin rice paper, printed on one side only with the pairs of leaves left unopened. 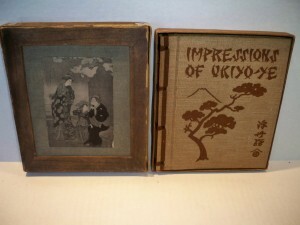 Plates of ukiyo-ye scenes are inserted on white coated stock. The papers covering the inside of the boards contain pulped bark, a method that Elder used on several occasions. I can find little information about Dora Amsden (11 Jun 1853–12 Jun 1947). Her brother Charles Watson Jackson was the brother-in-law of Thomas Dykes Beasley, who wrote Paul Elder’s book A Tramp Through Bret Harte Country. 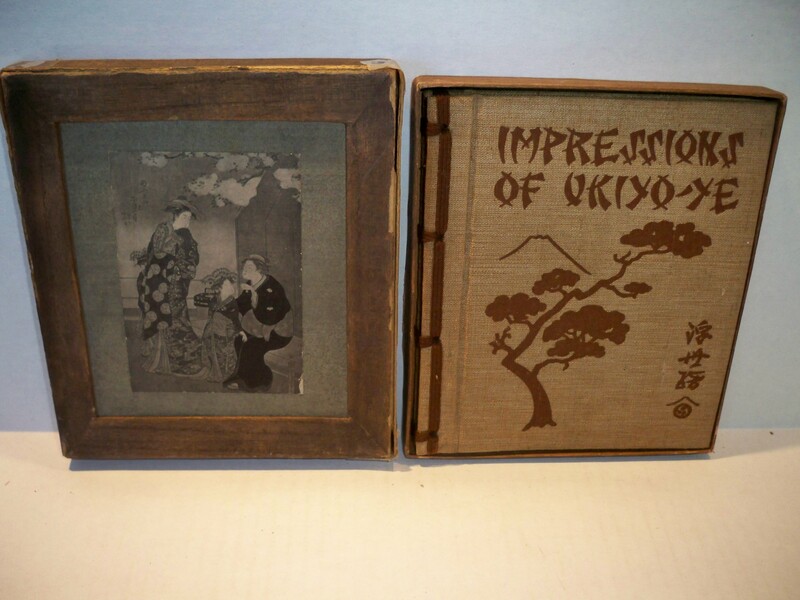 “Impressions of Ukiyo-Ye” with presentation box. Photo courtesy of Michael D. Panaro Books.